December 20th,1918. Shubuta, MS. Maggie and Alma House (sisters, 20 and 14 years old respectively), and Major and Andrew Clark (brothers, 20 and 18 years old respectively) were taken from the county jail at Shubuta, Mississippi, and lynched on a bridge over the Chickasawka river, a few miles from town. They were accused of conspiring to murder Dr. H.L. Johnston, who owned the land where they were all employed as laborers. 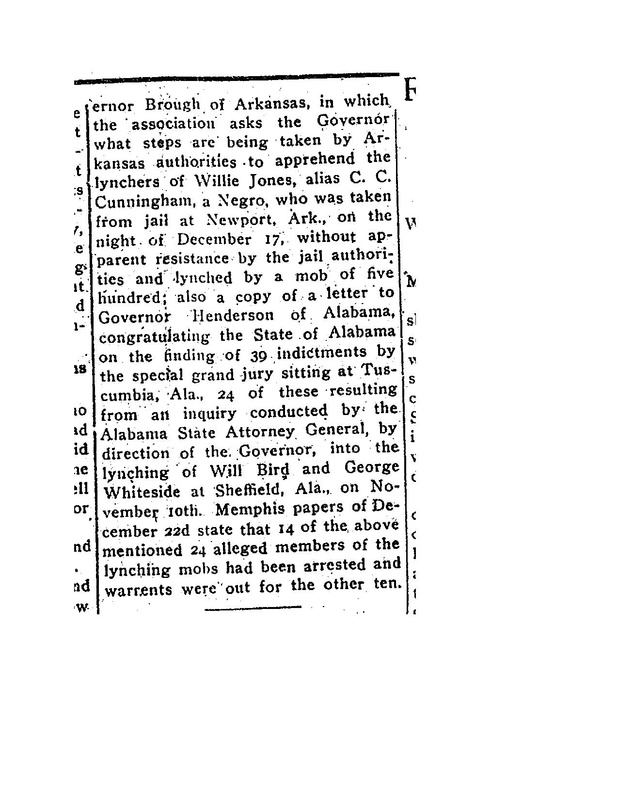 Initial reports of the incident included statements from Deputy Sheriff William Crane, the officer on duty when the lynching occurred, who explained his failure to protect his prisoners with the story of having been overpowered by masked men, made to surrender his keys, and forcibly restrained while members of the lynch mob removed the Clark brothers and House sisters from their cells and brought them outside to waiting automobiles. In some renderings, the sisters names were given as Howze. The NAACP employed a private detective named Robert Church, a white man from Memphis, Tennessee, to travel to Shubuta and investigate this quadruple lynching. The investigation revealed troubling inconsistencies with the version of events published in contemporary news clippings. Local papers had reported that the alleged murder victim was a wealthy, retired dentist; Detective Church found that the actual victim was the dentist’s son (of the same name), and that he was rumored to have repeatedly forced himself on both of the House sisters. Alma House was further rumored to be pregnant with Dr. Johnston’s child. According to Church’s report, the affair was discovered by the Clark brothers when they arrived to live on the farm for what was supposed to be a brief stint of labor to pay off a debt incurred by their father after he purchased a mule from the older Dr. Johnston. Major Clark and Maggie House enjoyed each other’s company; however, their relationship was threatened by the possessive claims of the younger Dr. Johnston, who threatened to kill Major if he did not end the relationship. On December 10th, Dr. Johnston was shot and killed; in the words of Detective Church, his killing is “surrounded in mystery,” and “as all of the principals are dead, it will never be known how Dr. Johnston met his death.” Despite the lack of clear evidence, all four siblings were killed by local citizens in concert with police from two different counties. 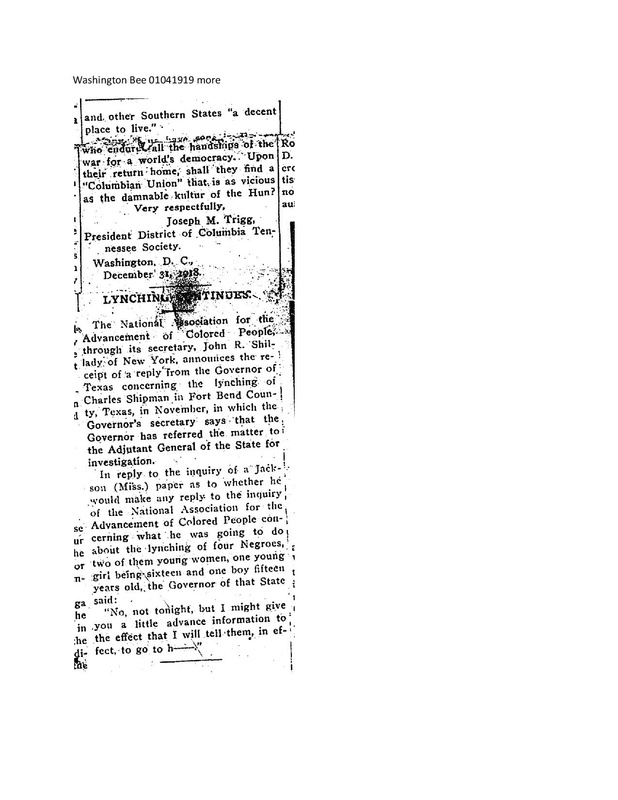 The Clark-House lynching was a well-planned, choreographed affair. Plans were made in advance, transportation was organized for potential spectators, and logistical arrangements were made regarding transportation of the prisoners and the site of the execution. Detective Church’s investigation revealed that the arrestees were first moved to two different county jails each several miles from Shubuta. In the jail in Meridian, police tortured Andrew Clark until they extracted a confession that he helped his brother murder Dr. Johnston. Several days later, all four prisoners were returned to Shubuta for a preliminary trial; by this time, the lynching was already the subject of open discussion around town. During the day “automobiles began pouring into the little town, as well as other vehicles and individuals on foot.” If not previously aware that a lynching was to occur, by this point it seems unlikely that local law enforcement could have failed to notice such an uptick in pedestrian and vehicular traffic. Indeed, Church’s report indicates that the Chief of Police from the jail in Meridian, where Andrew Clark had been tortured before being returned to Shubuta, was among those who arrived by auto late in the afternoon of December 20th. Although [Deputy Sheriff Crane] states that he was overpowered and forced to surrender the keys to the jail, the evidence shows that he went into the street in front of the jail at the request of the mob, allowed them to handcuff him, take his keys from him, and go into the jail and take the four prisoners without any trouble whatever. […] There is no evidence to show that he made any attempt whatever to protect the prisoners in his charge or to prevent the mob from taking them from the jail. This section of the report concludes with the curious detail that, “At the same time that the mob was approaching the jail, another group went in the power house nearby and shut off all light from the town, plunging it in darkness.” Presumably, this was done to lend credence later on to the inability of witnesses to identify any particular individual as the lynch mob’s leader. This multiple-lynching is listed in several sources. It can be found in Project HAL’s database. It is also listed in the NAACP’s Thirty Years of Lynching in the United States, 1898 – 1918. 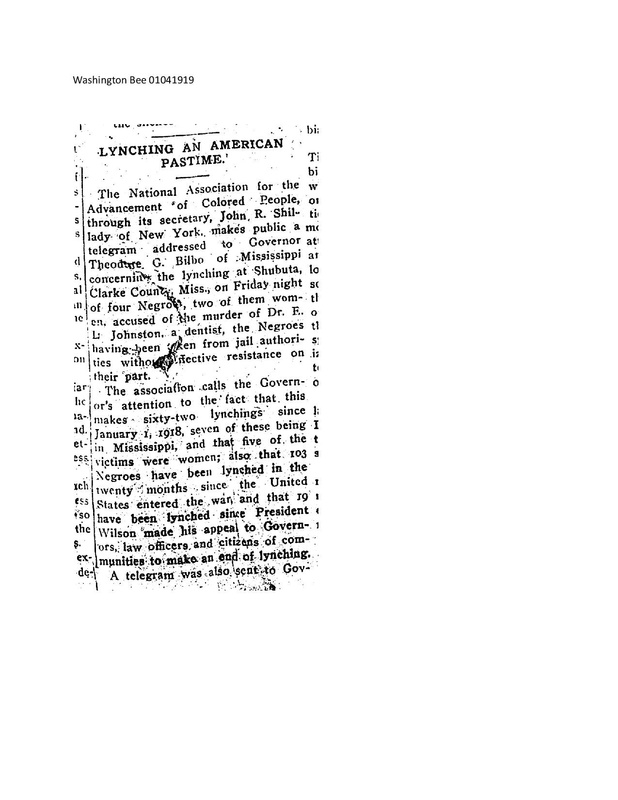 The NAACP’s letter of protest to the governor of Mississippi is reprinted as “Lynching: An American Pastime,” in The Washington Bee, Jan. 4, 1919. Information about the NAACP’s investigation of the case can be found in the subject files on lynching: NAACP papers, Part 7, Series A, Reels 1 and 2, University of Michigan microfilm collections. The incident is also described in Terrence Finnegan’s A Deed So Accursed: Lynching in Mississippi and South Carolina, 1881 – 1940, (2013).